It's happening, it's happening! 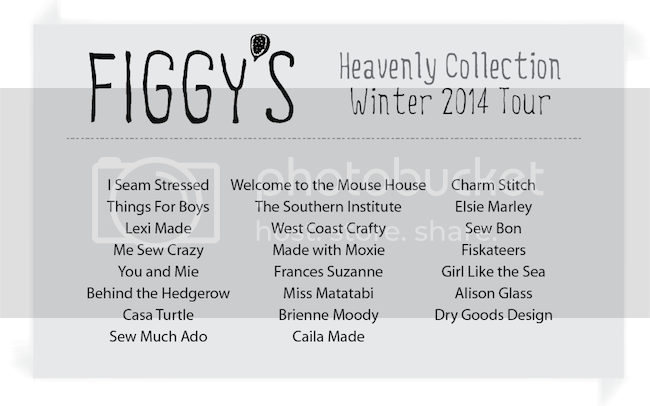 I'm the next stop on the Figgy's Tour today in tandem with Frances of Miss Matabi. I'm so excited to be included in the tour and I'm really excited to share some samples of these great patterns with you. It turns out, that I've actually made several items from the collection already but let's start with the garments that I made for the tour. First up, a Celestial Maxi Skirt for Hiver. Shelly's patterns are carefully drafted, exampled and well detailed. The garments are simply yet distinctively shaped. I was drawn to the maxi skirt because of it's potential for embellishment. The contours of the skirt make it fun for swishing but the curve in the front and back leave the legs free for climbing. I've been saving up this pink Nani Iro for some time - love, love!! I'd like to make it a staple... And this skirt seemed like the perfect use for it. The fabric was a little bit coarse-feeling and sheer, so I decided to line the skirt with a really soft white baby rib and to let the layer hang out underneath. I wanted the skirt to look easy and not too formal. And as you know, I'm a sucker for layers. Somebody stop me. I added buttonholes and a drawstring too. I wrapped the string with embroidery floss using this tutorial. Next I stitched up the Celestial Pullover in a soft lavender fleece. I wasn't sure that the fleece would work, it's not very stretchy - but it passed the 20% stretch test, which is what the pattern calls for. It's so super cozy and the short sleeves are a smart complement to the cowl neck. She had it on outside today and with hands in the pockets and the temperature stretching into the teens, it was just the perfect thing. I topstitched the pockets too, to keep them from shifting below the hem and to give the top some detail. Below are the other things that I've made so far from the collection. Now! A couple more things - I know you're already stuffed. After you've gone on ahead and picked up the new Figgy's Collection (it's on sale!) Head right on over to check out Frances's post. And then, head to her shop and get some fabric - it is so, so gorgeous. And her customer service is dynamite. Seriously. Plus, she's got fabric on sale right now too. Woot! And be sure to check out what these fine sewists are stitching up. Don't foget to enter the giveaway at the end of this post! P.S. I am not in any way affiliated with well, anybody. I just think that Shelly is the bees knees and her patterns would make you happy. Regarding Miss Matabi, I just love her selection and have had excellent sales experiences with her in the past.